I like this time of year. As the days start to get longer and the weather starts to warm I can't help myself and I must get out and play in the dirt. There's something about the smell of freshly turned warm earth, the feel of it sifting through my fingers, the hope of new beginnings that it brings. It's soothing to me. It rejuvenates my spirit. Digging around removing weeds, preparing the ground for new growth is like therapy. It reminds me that my life often needs the same things the earth does to be productive. I need to remove what's unnecessary and create fertile soil for new ideas to grow. Sometimes when I'm digging around my mind works on things that are bothering me or problems I can't seem to find a solution to. Often times my mind just wanders and my focus shifts from the many distractions in my life to smaller things like the interesting shape of a flower just before it blooms, or the many segments of a fat earthworm and how it moves through the soil and knows how to get away from me without any eyes. Sometimes my heart hears the voice of my Creator telling me how special I am and how I might fit into his amazingly designed world. Digging in the dirt, planting my garden is an act of faith. I put a seed in the ground. The sun warms it, the rain moistens it, the nutrients in the earth nourish it and I believe it will sprout and grow into something beautiful and wondrous without much help from me. Sometimes it's hard to have that faith when it's been some time and you still haven't seen a sprout, but eventually the miracle happens and one day....there it is!! Digging in the dirt teaches me about life and faith. It reminds me how connected everything is. 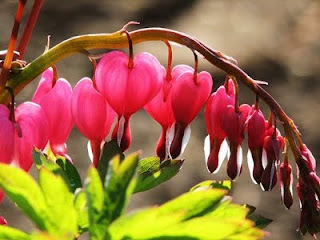 It reminds me of miracles and how things that we hope for happen in their own time. It reminds me to slow down and enjoy the beauty around me. And even after a long hard day of digging, weeding and planting I am always filled with a sense of peace and that all is right with the world. I hope wherever you are you can get out and enjoy a renewing of your spirit by connecting with something living and wondrous that the Creator has made especially for you. If you find it digging in the dirt so much the better, but you may just find it in the unique design of a flower that by some miracle we don't understand and with no help from you, came up all on it's own to reveal it's beauty to the world and offer us hope. While pondering my next painting today I realized that I had neglected to post my last commissioned piece of another Pudelpointer. So here it is! This painting represents what I call my "past to present" style of portrait which features the same animal from puppy to adult dog. 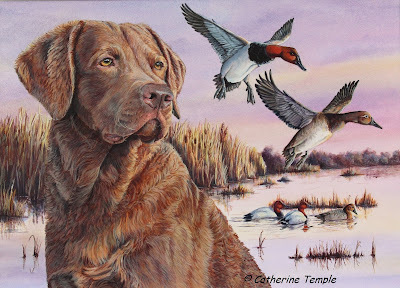 In this case, three stages of Tukr's life are included as well as background from a favorite hunting spot and some of the chukar that he hunts. This was a fairly large and involved painting, 16" x 20" and is painted in acrylic. My client owns Cedarwood Kennels in Boise, Id. and is the breeder of this wonderful dog and many great pudelpointers like him. If you are interested in this unique, versatile hunting breed I suggest you contact them and they will be happy to answer all your questions. Their website is www.cedarwoodgundogs.com. 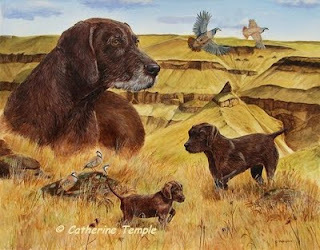 I have been thinking of trying this style of painting called a "montage" on some of my wildlife and bird subjects. 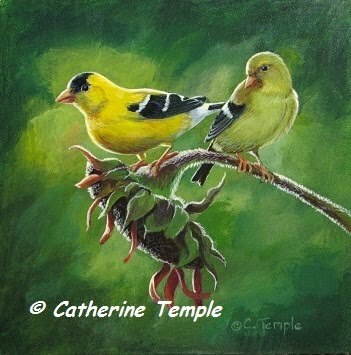 I would like the painting to tell a story or educate the viewer about that animal and by depicting different poses or perhaps including their nests or eggs it would give a more complete picture than just a single pose. I'm still toying with this idea, but when I'm ready to paint it you'll be the first to see it here. If you have a beloved pet or a favorite animal or bird that you would like a portrait of I would be honored to create one for you or for someone special in your life. They make exceptional gifts! Just shoot me off an email and we can discuss getting started! You can contact me at ctemple99@gmail.com. To see other portraits I've done you can view my two websites....www.catherinetemple.com and www.petportraitsbycatherine.com. I hope to hear from you soon! The past few days have been rainy and dreary and my attitude seems to be matching the weather. Not feeling particularly inspired about what to paint next since finishing my commissions, I decided the best thing to do was just put a pencil on paper and sketch something. While I normally find the process of drawing and painting very engrossing, this time I also felt it to be very therapeutic and centering. As I sketched away my mood lifted and the things that seemed to be troubling me disappeared at least for a time. Sitting and doing this also allowed my mind to wander back to my childhood. Whenever I was worried or upset or just annoyed with my sisters I would seek out a quiet place in the fields around my house and hide in the tall grass or bushes and draw pictures of the wildlife I saw. It always made me feel better and I realized that I still do the same things now. Whenever I feel like I just can't cope with reality I run off to nature and try to find peace. Since the weather was so nasty I ran off to my studio and sketched, but the end result was almost as good! I started off sketching from some photos that I had taken of birds, but then I decided to check in on a live web cam that I have been watching that's on an eagles nest in Iowa. It was a great opportunity to sketch something alive and moving and something that I ordinarily would not have much chance of seeing unless I found a nest and climbed a tree. Two of the three eggs in the nest have hatched so there are baby eaglets to sketch as well. Most of the time one of the adult eagles is sitting on the nest and there's not much activity, but even still the bird moves it's head around continually so you have to be quick to finish a pose. Then when it's feeding time everyone in the nest is moving, but sketching like that is excellent practice. It teaches great hand-eye coordination and you really have to pay attention to what you're seeing to get it right. If anyone is interested in viewing the link to the site is http://www.ustream.tv/decoraheagles#utm_campaigne=synclickback&source=http://www.raptorresource.org/falcon_cams/decorah_eagle_xcel.html&medium=3064708. I have done some checking and have found there are other live web cams out there to view so perhaps I will spend a little more time getting an intimate look at nature from the comfort of my studio. This, of course, will never be as good as getting out into nature itself and I try to do that daily and encourage others to do the same. While computers are great for a lot of things they are not a substitute for fresh air and sunshine and physically connecting with our environment. We need more of that. Go do some therapy!!! !